Thanks to the generosity of two dedicated donors, Fordham has just significantly strengthened its commitment to science education. On Sept. 26, the University installed three accomplished scholars as new faculty chairs in the STEM fields: Silvia C. Finnemann, Ph.D., a Fordham biology professor whose research focuses on eye-cell function; Hans-Joachim Hein, Ph.D., a Fordham math professor who has earned international recognition for his geometry research, and Joshua A. Schrier, Ph.D., a chemistry professor and researcher who recently joined Fordham’s faculty from Haverford College. The three assumed the Kim B. and Stephen E. Bepler Chairs in Biology, Mathematics, and Chemistry, respectively. 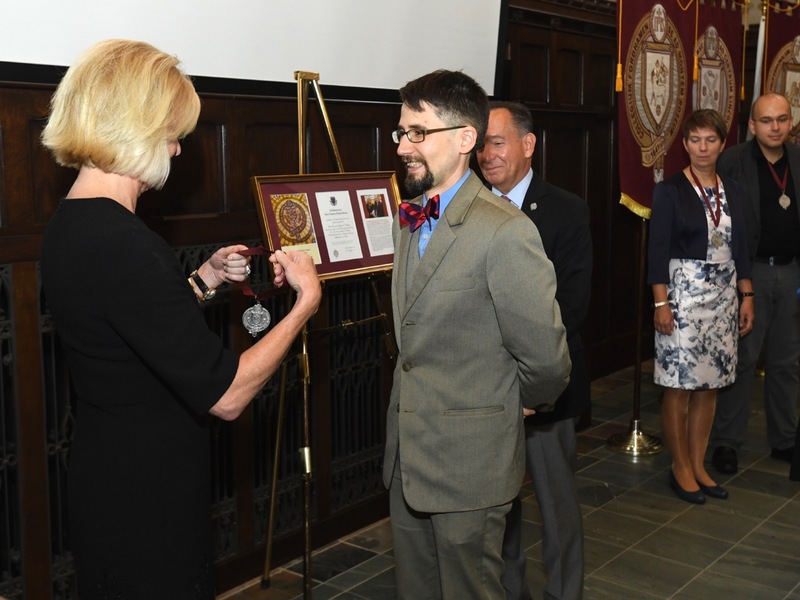 “This evening’s ceremony and installation of the new Bepler STEM faculty chairs redefines what it means to study the sciences at Fordham,” said Frederick J. Wertz, Ph.D., interim dean of Fordham College at Lincoln Center. The endowed professorships not only bolster Fordham’s commitment to the STEM fields—they also reshape the legacy of the donors who made them possible: the late Steve Bepler, FCRH ’64, and Kim Bepler. “Kim and Steve’s dedication to advancing the sciences has and will continue to foster countless opportunities for future generations of talented Fordham students eager to transform the world in which we live,” said Wertz. The chairs were funded using part of a $10.5 million gift made by Steve’s estate and Kim in July 2017. The gift also funded a chair in physics, which has yet to be filled. Fifty-four years ago, Steve Bepler graduated from Fordham College at Rose Hill. He rose to become senior vice president of Capital Research Global Investors, received an honorary doctorate from Fordham, and served as a University trustee. His widow, Kim, serves as a Fordham honorary trustee fellow. 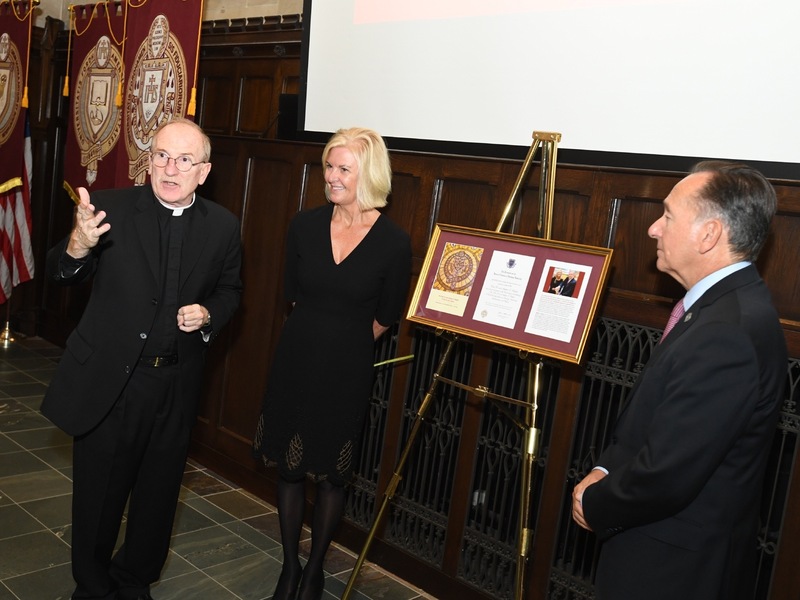 Father McShane pays tribute to Kim and Steve Bepler as Robert Daleo, chair of Fordham’s Board of Trustees, look on. Together, the couple made many significant gifts that will benefit Fordham students for years to come. They established two other endowed chairs—one in theology, the other in poetics; created scholarships; helped restore the University Church; and supported several programs across the University. Next month marks two years since Steve’s untimely passing in 2016. “I often teased Steve when he was alive that he was one of the few people who said a prayer for generosity, and God heard his prayer,” said Father McShane, to a round of laughter. Kim said her husband was generous, but he shied away from the spotlight. “He would have frankly taken great exception to naming the STEM chairs after him. So, Father, when you get to heaven, you have some explaining to do,” she said. The crowd chuckled. Father McShane recounted a memory of Steve wandering through the Rose Hill bookstore. The clerk, wondering if he was the father of a student, asked if he needed help. Steve declined, but when he continued to meander, the clerk returned. “What are you doing?” he asked. From eye health to quantum gravity to energy technology, the work of the new Bepler chairs spans several scientific disciplines. Finnemann’s research has shed light on what causes blindness and how it can be prevented. Specifically, it focuses on the cell biology and diseases of the eye, particularly age-related macular degeneration—the most common cause of adult blindness in the United States. Her work has led to more than 50 publications in widely acclaimed international journals. 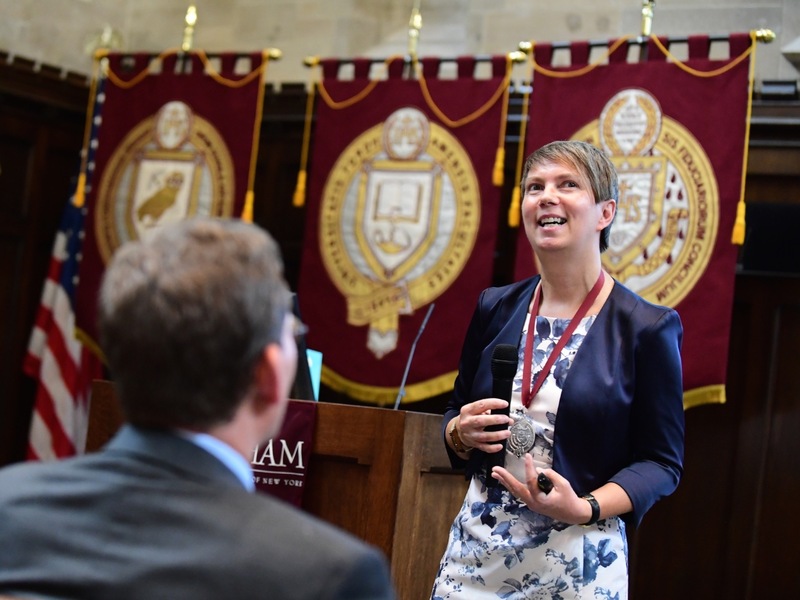 At Fordham, she has helped the biology department obtain critical grant support from the National Institutes of Health, and she received the 2013 Fordham Award for Excellence in Teaching. She serves on the editorial board of Nature’s Scientific Reports and consults for the U.S. Department of Health and Human Services/NIH. Hein’s research on quantum theories of gravity was published in the most selective journal in mathematics. He is one of the world’s leading experts on gravitational instantons—a key concept in quantum theories of gravity—and has earned international recognition for his research in differential geometry. Hein has held appointments at Imperial College London, the University of Nantes, the University of Maryland, and as of 2016, Fordham. Kim Bepler presents Joshua Schrier, the Kim B. and Stephen E. Bepler Chair in Chemistry, with his medal. Schrier’s expertise is in the computational design of new materials in information and energy technology. He has authored 44 peer-reviewed papers and secured more than $8.6 million in external funding. 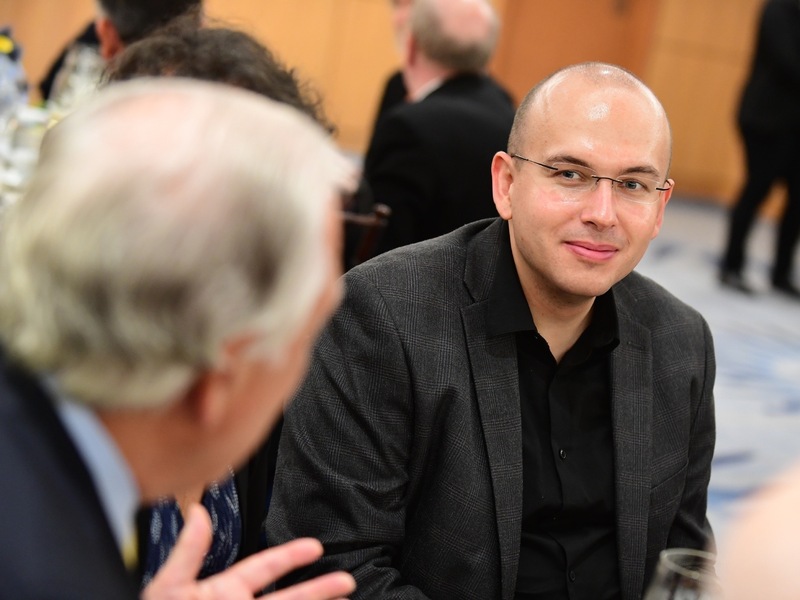 Schrier was a Fulbright scholar at the Fritz Haber Institute of the Max Planck Society in Berlin and a Luis W. Alvarez postdoctoral fellow at the Lawrence Berkeley National Laboratory. This is his first year at Fordham. After accepting their engraved medals, the three new chairs explained their research under the 47-foot-high sloped ceiling and stained-glass window of Tognino Hall. They used layman’s lingo and pictures: a purple cross-section of a human eye, a crumpled piece of graph paper that illustrated warped space, the iconic black-and-white shot of Albert Einstein sticking out his tongue, and robots with googly eyes. 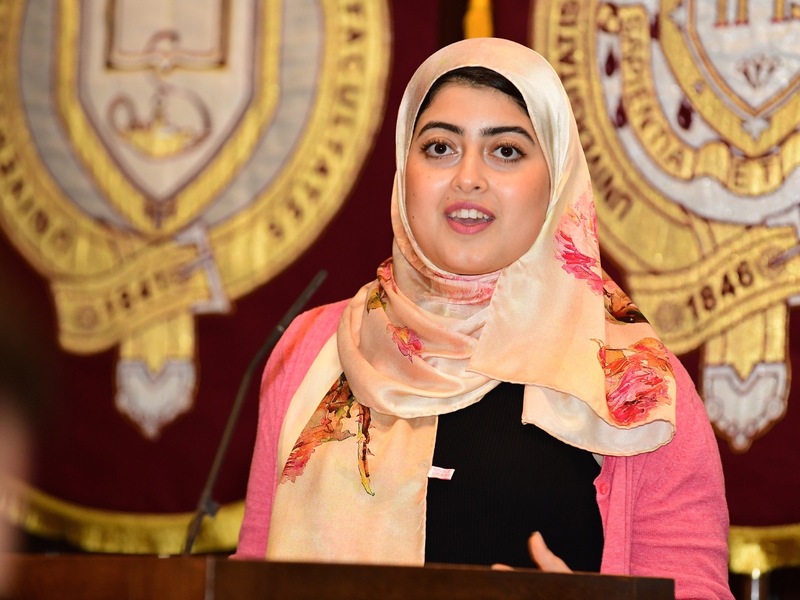 Salma Youssef, FCRH ’20, the student speaker at the event, said that the new professorships enhanced math and science education at Fordham. Salma Youssef, the event’s student speaker, said she was grateful for the generosity of Fordham donors. Youssef won a Fordham research fellowship that allowed her to study conservation biology. Over the past 15 years, Fordham’s number of endowed chairs has more than tripled to reach 71, including the new Bepler chairs.